If you’re into geeky things, then you’ve likely already built your den. That said, in video games there’s a difference between a noob starting area populated by wolves and boars and a max level dungeon filled to the rafters with ethereal beasts. Your nerdy area might be a place to chill out and get sloppy, but some design tips can make it magical. 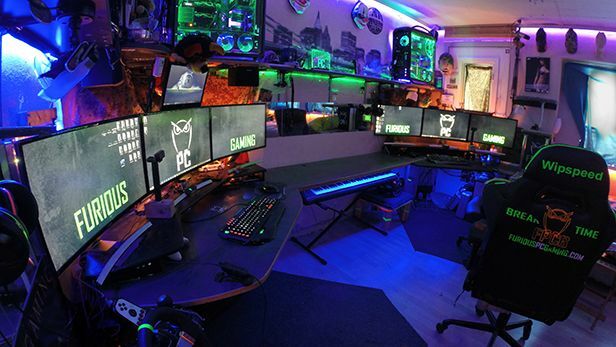 Consequently, here’s some advice to help you create the ultimate geek den. During those long gaming sessions, it can be annoying to have to keep getting up to retrieve a snack or two from the kitchen. That irritation goes tenfold when you have friends round to entertain and keep satisfied. Apparently, all the cold drinks and chilled chocolate need to be kept in the kitchen, meaning you’re doomed to hours and hours of back and forth. Or are you? Invest in a quality mini fridge to really get serious about eliminating exercise from your routine. All your cooled goodies can be safely stored nearby as you game, read or get creative with your own material. Any mini fridge will fit in any room extremely easily due to their smaller size and, also, the cost is fairly low, making them a very efficient buy. Add one to your room to avoid small talking with anyone you live with when all you want is a drink! Few things beat a comfy chair. After all, there’s nothing worse than sitting on a chair that feels as if it’s made of wood and purposed to dig into your rear. If you work in your den or simply enjoy getting headshots on a favourite game, then you need to be comfortable for those hard grinds. These are long term goals here, and dining room chairs or an armchair from the living room won’t work well in your den. Consequently, consider investing in a quality desk chair built to purpose. It’ll come with arm rests for you to lean on during moments of intense thought and reflection and be designed with materials and techniques that keep you comfortable for long periods of time. Moreover, it’ll fit in with the room aesthetic too, instead of being a jarring difference between work desk and armchair. Complete the classic pairing of desk furniture and snag yourself a quality chair. When a room is only made up of furniture, it can start to look a little bare. While they can reveal glimpses of a personality, it’s the extra titbits and various tat that really boast character. Space needs to be filled and details are intriguing, so really start to think of things big and small that can enhance the appeal of the room. Remember, in terms of shelving room empty space is wasted space.